The autonomic nervous system (ANS) regulates physiologic processes, such as blood pressure, heart rate, body temperature, digestion, metabolism, fluid and electrolyte balance, sweating, urination, defecation, sexual response, and other processes. Regulation occurs without conscious control, i.e., autonomously. The ANS has two major divisions: the sympathetic and parasympathetic systems. Many organs are controlled primarily by either the sympathetic or parasympathetic system, although they may receive input from both; occasionally, functions are reciprocal (e.g., sympathetic input increases heart rate; parasympathetic decreases it). Autonomic Regulation is the body’s ability to maintain homeostasis (stability and balance) during internal and external stimuli. Autonomic Regulation is always functioning, and we are often unaware of the important tasks it is performing. When the nerves that control Autonomic Regulation are damaged, Autonomic Dysfunction can develop. Autonomic Dysfunction can be temporary or chronic. Diabetes and Parkinson’s disease are two examples of chronic conditions that can lead to Autonomic Dysfunction. VitalScan ANS+ tests Autonomic Regulation through a combination of Heart Rate Variability (HRV) Assessment and Cardiac Autonomic Reflex Tests (CARTs). Cardiovagal innervation testing evaluates heart rate response to deep breathing and to the Valsalva maneuver, via electrocardiogram rhythm strip. If the ANS is intact, heart rate varies with these maneuvers; the ratio of longest to shortest R-R interval (Valsalva ratio) should be 1.4 or greater. Vasomotor adrenergic innervation testing evaluates response of beat-to-beat blood pressure to the head-up tilt and Valsalva maneuver. The head-up tilt shifts blood to dependent parts, causing reflex responses. The Valsalva maneuver increases intrathoracic pressure and reduces venous return, causing blood pressure changes and reflex vasoconstriction. In both tests, the pattern of responses is an index of adrenergic function. Autonomic nervous system (ANS) testing, including parasympathetic function (cardiovagal innervation), sympathetic adrenergic function (vasomotor adrenergic innervation). Diagnose the presence of autonomic neuropathy in a patient with signs or symptoms suggesting a progressive autonomic neuropathy, including: Diabetic neuropathy, Amyloid neuropathy, Sjogren’s syndrome, Idiopathic neuropathy, Pure autonomic failure, Multiple system dystrophy. Evaluate and treat patients with recurrent unexplained syncope to demonstrate autonomic failure. ANS analysis measures neuro-cardiac function which reflects heart-brain interactions and autonomic nervous system dynamics. The autonomic nervous system is involved in the function of virtually every organ system and clinical manifestations of autonomic dysfunction are involved in just about every disease. As a result, ANS analysis is used as a screening and monitoring tool in many disease processes. Autonomic Balance Studies -Heart Rate Variability Assessment has acquired exceptional popularity over the last few years. Nowadays, the main stream medical associations around the world accept ANS studies as one of the best predictors of specific and non-specific health risk. Scientific and Clinical studies have established its usefulness in almost all branches of medicine. VitalScan systems provide Autonomic Function testing which enable physicians to monitor the activity of both the sympathetic and parasympathetic branches of the autonomic nervous system (ANS) in order to accurately assess the state of a patient's autonomic function. VitalScan provides a two-pronged approach to patient evaluation. Firstly, VitalScan is able to detect specific types of autonomic dysfunction which can consequently be linked to a multitude of clinical diagnoses. Secondly, VitalScan can be utilized for thorough, comprehensive assessments and physiological monitoring which provide physicians with a detailed and thorough patient appraisal which can often be overlooked in standard evaluations. HRV analysis is based upon measuring variability in heart rate; specifically, variability in intervals between R waves - "RR intervals". These RR intervals are then analyzed by spectral (as in VitalScan) or some other form of mathematical analysis. Such mathematical analysis generates multiple parameters; time domain and frequency domain. The problem of SNS-PSNS quantification is in reducing all possible variations of these multiple parameters to a quantitative relationship between the SNS and PSNS. For many years, this issue has been the central obstacle in HRV analysis. VitalScan is the first and only system to solve the problem of SNS-PSNS quantification. This technological breakthrough is achieved by using proprietary algorithms and a pioneering approach. The algorithms used by VitalScan have been developed and tested exhaustively for over 30 years. Studies of efficacy and accuracy have involved over 50,000 patients to ensure success. The result of this in depth research is objective and reliable evaluations of ANS state during rest, during Orthostatic (seated-to-standing) testing and during the Valsalva maneuver combined with deep breathing. VitalScan analyses are far-reaching and highly sophisticated. Consequently, VitalScan is the only method that enables precise recognition and classification of up to 100 ANS states while providing corresponding descriptions of each. Until the development of the VitalScan method, there was no practical means of assessing ANS independently outside of a research laboratory. VitalScan brought laboratory analyses into the physician's office and became the first and only system to provide a quantitative interpretation of HRV spectral function as well as a qualitative analysis of the resulting parameters. 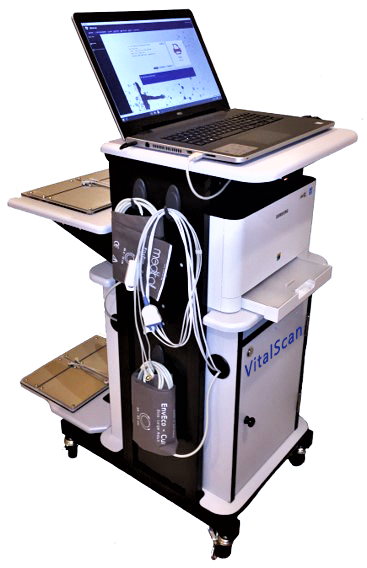 The goal and achievement of the VitalScan research team is in providing physicians worldwide with a reliable office device capable of multiple clinical applications including the assessment of risk in cardiovascular diseases, objective assessment of benefit for cardiac and orthopedic intervention, and the quantification of drug effect on the autonomic function.